Once the important path through to the industrial estates, these two roads no longer form a continuous route. Documented throughout its life as being too steep for large vehicles and novices, this road starts at a wide turning on the High Street, being the main access in to Wallington. It was used a lot by army vehicles accessing the fortresses during the war, and in 1957 it was briefly closed having been declared redundant without a war to support it. Yvery House was at the top of the road, being expanded to become The Old Manor and Old Manor Cottage. 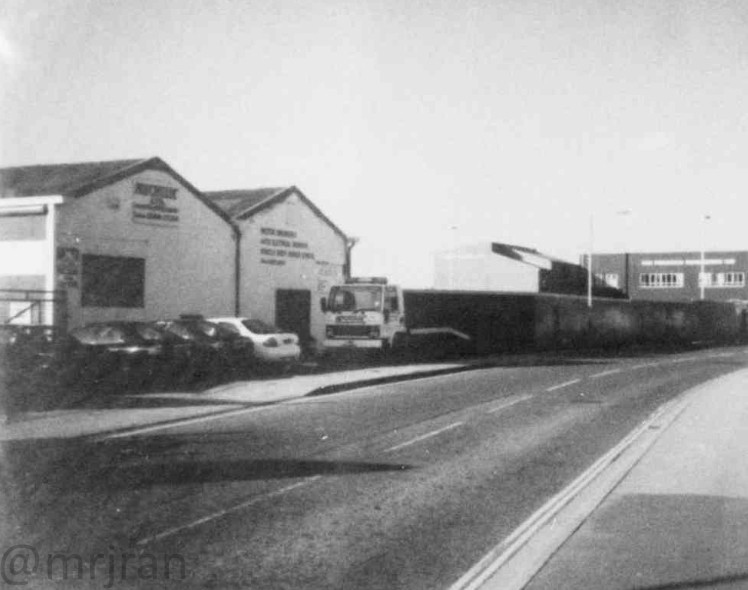 In 1981 the bottom of the hill was closed to make way for Wallington Way, built over a nursery at the bottom. After this a new business park opened at the bottom, and The Old Manor was extended. Wallington Bridge was built in 1715 as a red-brick crossing of the river at its highest tidal point, providing access to the central region of the village. In the 1970s it was due to be rebuilt to reduce its contribution to flooding, but a local village organisation was formed to stop this and in 1976 it became a listed structure. The organisation still runs and the village still stands, as both a symbol of the village and, at high water, its flooding problems. Narrow in width, the bridge was accompanied by a wooden footbridge which was removed in the 1980s when the main bridge was disconnected from Wallington Hill. To the left is evidence of the original fording point, and the reason Wallington formed. It now serves as only a footbridge. Originally a small side-turning at the bottom of the hill, this junction is now consumed by the ramps for the footbridge over Wallington Way, as is most of the bottom of the hill. The original alignment of the road can broadly be traced by that of the footpath along the river. For much of its length Broadcut was a dirty track which ran level with the river. Now busier and slightly cleaner, it's still broadly level with the river but this is difficult to appreciate given the huge flood defence which was built alongside it. For many years the water coming onto the road was unheard of, but recent changes to the river bed mean it now comes up through the drainage. The start of the road was diverted to meet the A32. A roundabout was added to access Sainsbury's, which used to be Manor Gardens Caravan Park and had a stream running through it. 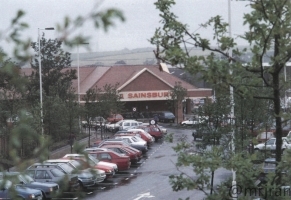 Sainsbury's opened on 6 July 1993. It claimed that it offered relief for drivers who were getting stressed trying to access the Thackeray Mall store, but added that both would remain open. The bronze wall sculpture, which has been moved around a few times, was by David Backhouse and illustrates children throughout the ages. A number of changes were made before the original plan came to fruition: two revolving doors were replaced with a smaller lobby to make room for a coffee shop (which became the restaurant in 1995 anyway); there was originally going to be space for a bus to turn around on the service road (a bus stop was later built in the car park, but the service didn't last long); the roundabout on Broadcut was added to allow people on Broadcut to turn right; a roundabout in the middle of the car park was removed; the ramp at the back was added. The Dreams and Poundstretcher (née Staples) building was a factory and six properties called Riverside Terrace, plus two buildings called Broadcroft and Lowermead. Those houses were pulled down in the 1990s, and we had the Schweppes factory, White & Loch Ltd and a concrete plant. 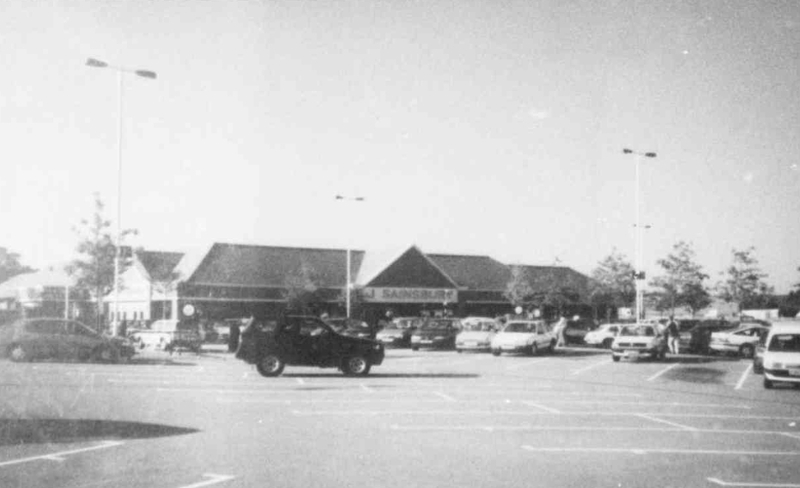 The whole area was left derelict for several years having been purchased by Sainsbury's. 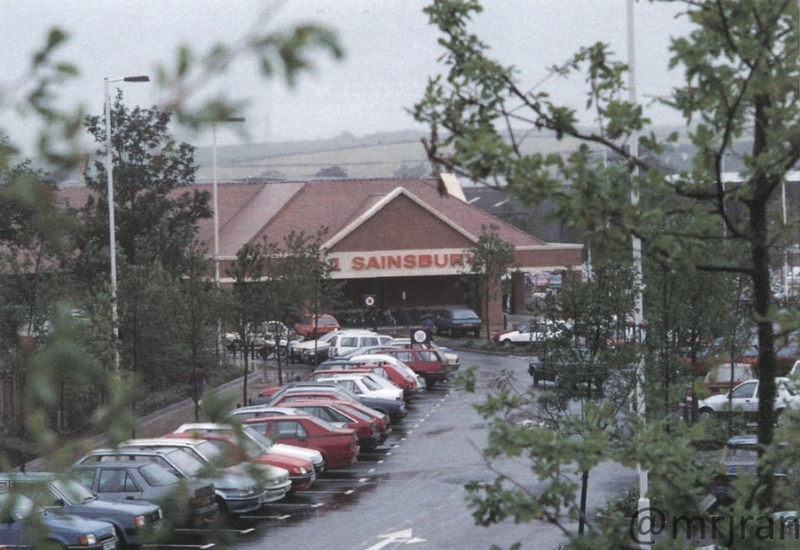 When Sainsbury's was built, they wanted this bit to become a single-building retail park. 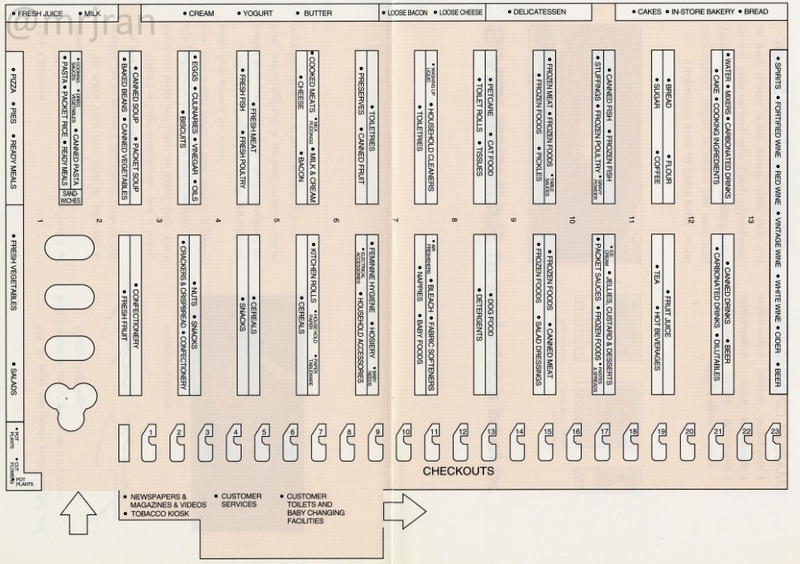 A later plan (1995) was for it to become a warehouse, while another (1997) was for a Halfords and a drive thru. A Costa was built in the corner in 2019, now one of many in Fareham. Before all this, Wallington Tannery was the first point of interest on the road. 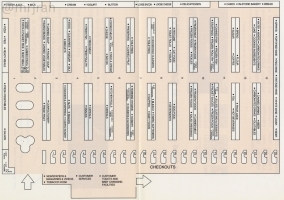 Its access point is now the access to Luckett's coach yard. Shortly before here the road 'changed sides': as the river sprouted a small tributary, the road dog-legged to cross it. Now only a small stream which lies underground you would be forgiven for not noticing it, but crossing it was once a feat in itself. A pathway on this side of the stream was once known as Watery Lane, and is perhaps the pre-motoring route of the road. The 1950s saw various industrial units come to use here. Buildings included The Villa, Clapgate House and the coal yard. Wallington's permanent village hall was built in 1995, replacing the tin hut. Its car park replaced parkland. 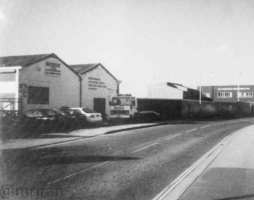 By here, Broadcut begin to run out of energy and went back to being a quiet lane, until the industrial units sprouted up in the 1980s - the initial ones were so popular they were expanded, and many eventually moved to Whiteley. The ones nearest Broadcut saw the urbanisation of The Watermeadows. Just beyond the council depot some grass space appears on the west. This is where the road has been straightened as part of its development. A pond is also shown here. The actual end of the road at Standard Way sees a footpath continue beyond, and the former Watery Lane appear on the far left. These together form a straight-line route which merges with Pook Lane and heads towards Wickham, passing Clapgate Cottages and Augustine Farm which are now part of The Meadows.